On a large platter, layer lettuce bacon, eggs, tomatoes, and green beans. Heat a grill pan with a lid over medium heat. Rub salmon with olive oil; sprinkle with salt and pepper. Place salmon, skin side up , in pan. Cover and cook for 5 minutes. Turn salmon and cook 5 to 6 minutes more or to desired degree of doneness. Flake salmon into large pieces, discrding skin. 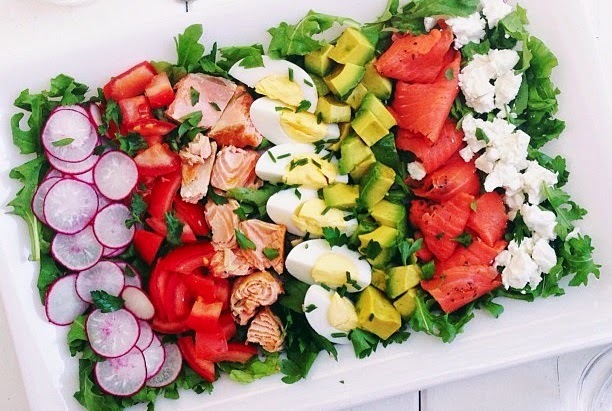 Layer salmon over salad, and drizzle with fresh dill dressing. In a small bowl, whisk together all ingredients. Cover and refrigerate up to 1 week.